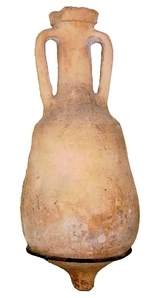 The Lamboglia 2 amphorae were replaced by the Dressel 6A whose form they closely resemble. Very often these Dressel 6A amphorae were produced in Lamboglia 2 workshops, and it is often difficult to distinguish the two types from each other when fragmentary. The forms of the amphorae in this group also exhibit a wide variety. The handles are round in section rather than oval and the neck is longer and more slender in relation to the body. Sometimes they are stamped on the rim and the neck. Late first century BC to mid first century AD (Carre, 1985; Piccottini, 1997; Bezeczky, 1998a). The type is generally considered to come along the Adriatic from Calabria up to Rimini (Panella, 1970; Buchi, 1971; Baldacci, 1969; Carre, 1985; Van der Werff, 1986; Bezeczky, 1998). Italy, particularly the north-east region, Croatia, Slovenia, Yugoslavia, France, Britain, north Africa, Dalmatia, Noricum, Pannonia and the Aegean (Carre, 1985; Tchernia, 1986; Cipriano and Carre 1989; Bezeczky, 1994d; Bruno, 1995; Bezeczky, 1998a; Lund, 2000; Bezeczky, 2001). Tituli picti mention wine and garum (Baldacci, 1969; Buchi, 1971, Piccottini, 1997), but it has long been thought that this form carried olive oil from Istria (Degrassi, 1962; Zevi, 1966; Will, 1996).